With the aid of our team, we have been able to offer high grade range of Anti Biotic Drugs. Accurately formulated offered anti biotic drugs are able to satisfy the patrons as these are processed as per the quality norms laid by pharmaceutical industry. 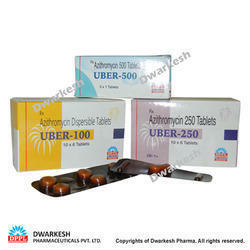 Furthermore, we also provide these anti biotic drugs as per the specifications given by patrons. Typical Usage: Upper and lower respiratory tract infections, skin and soft tissues infections, urogenital infections. Mechanism Of Action: Azithromycin binds to the 50S subunit of the 70S bacterial ribosomes, and therefore inhibits RNA-dependent protein synthesis in bacterial cells. We offer Amoxycillin & Potassium Clavulanate tablets. We manufacture Cefpodoxime with Clavulanic Acid Tablets. TYPICAL USAGE: Gram positive bacteria (especially Strep. pneumoniae, Staphylococcus, Enterococcus), Bacteroides fragilis, other anaerobes and mycobacteria. Pneumonia, exacerbations of chronic bronchitis. Sinusitis and other ENT infections.Tuberculosis. MAC infection in AIDS patients. Leprosy. MECHANISM OF ACTION: This medication is an antibiotic, prescribed for certain types of bacterial infections, including infections of the lungs, skin, blood, female reproductive organs and internal organs. We are acknowledged for offering our clients with high grade Levofloxacin Tablets which are manufactured using quality tested raw materials. 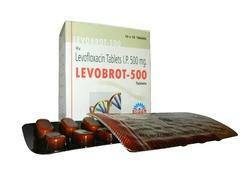 Offered Levofloxacin Tablets are non-allergic as these are processed by making use of quality tested ingredients that are sourced from the certified vendors of the industry. The tablets are available at industry leading prices to the customers. TYPICAL USAGE: Infections of respiratory, urinary and biliary tract. Salmonella infection. MECHANISM OF ACTION: Cefixime binds to specific penicillin-binding proteins (PBPs) located inside the bacterial cell wall, causing the inhibition of the third and last stage of bacterial cell wall synthesis. Cell lysis is then mediated by bacterial cell wall autolytic enzymes such as autolysins; it is possible that cefixime interferes with an autolysin inhibitor. 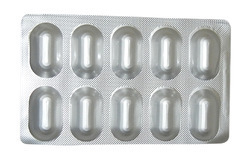 We manufacture Clavulanate with Cefixime Tablets. Typical usage :- Respiratory tract infections, prostatitis, urethritis, impetigo, folliculitis. Toxoplasmosis in pregnant women. Children. Mechanism of action :- Spiramycin is a macrolide antibacterial that inhibits protein synthesis by irreversibly binding to the 50S subunit of the ribosomal subunit thus blocking the transpeptidation or translocation reactions of susceptible organisms resulting in stunted cell growth. 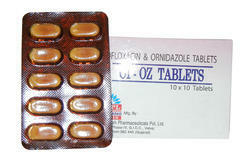 We manufacture ofloxacin - ornidazole tablets & suspension.